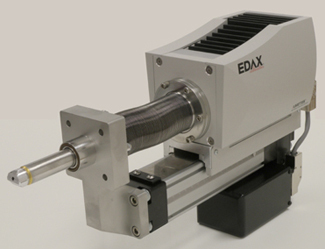 EDAX's TEAM™ EDS system featuring new Apollo XLT Silicon Drift Detector (SDD) Series provides the ultimate analytical solution for Transmission Electron Microscope (TEM) applications. The series includes the Apollo XLT with a Super Ultra Thin Window (SUTW) and a windowless version, the Apollo XLTW. EDAX is the first microanalysis company to introduce a windowless version of an SDD detector. The Apollo XLTW provides optimum light element performance with complete transmission of low energy X-rays. When compared to an SUTW detector, the light element sensitivity is improved up to 500% and the count rate is increased by 30% for heavy elements. As a result, the mapping speed and light element detection in low concentrations are greatly enhanced with the Apollo XLTW. Apollo XLT SDD Series incorporates data acquisition and signal processing electronics into the detector to simplify installation and to eliminate the need for a separate data acquisition enclosure. The integrated detector presents an elegant design that improves performance and offers easy remote access via Ethernet from virtually any computer. Signal distortion and loss due to cable length have been eliminated. The PC can be located up to 100 meters away from the detector without affecting the performance. Smart Features are at the core of our new TEAM™ EDS system with Apollo XLT for TEM. Intelligence has been built into the detector to provide the best protection against harmful conditions. The detector automatically retracts to a safe position when high energy electrons are detected. User intervention is not required, providing safe operation only achieved with Apollo XLT detectors. In case of maintenance needs, superior remote support is achieved with the detector's logging capability. The performance history recorded in the detector can be accessed remotely for a quick and accurate evaluation. TEAM™ EDS is built with a modern interface equipped with Smart Features that are automated to simplify analysis and provide quick results. Regardless of the skill of the operator, consistent and accurate results are achieved effectively and efficiently every time. TEAM™ EDS automatically determines the elements in your sample, monitors the count rate and magnification, collection time, as well as numerous other parameters used for optimum system performance. Interactive review allows users to preview the results in a unique way before the completion of analysis. The Apollo XLT SDD Series offers fully integrated data acquisition and signal processing electronics. Coupled with TEAM™ Smart Features, the system is the most intuitive and easy to use analytical tool available for the TEM. The Series offers a windowless version to further maximize collection efficiency and light element performance. TEAM™ Smart Features automate the work flow and revolutionize the way EDS analysis is done. Regardless of the skill of the operator, TEAM™ Smart Features provide exceptional results every time. The Apollo XLT SDD Series, in combination with TEAM™ EDS, provides the user with the most advanced EDS system for the TEM.